Freshman forward Taylor Moorehead handles the ball during the Aztecs 2-1 loss to Texas Tech on Aug. 24 at the SDSU Sports Deck. San Diego State women’s soccer fell short in a 2-1 match against Texas Tech on Aug. 24 at the SDSU Sports Deck. 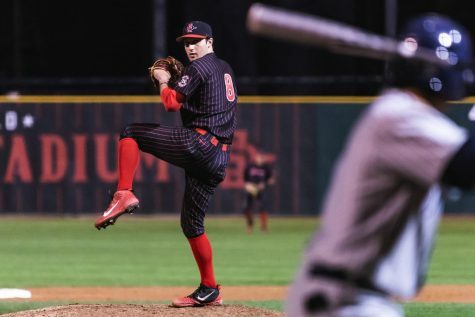 The teams met for the third straight season, and the loss kept the Aztecs win-less against their Big 12 Conference foe. 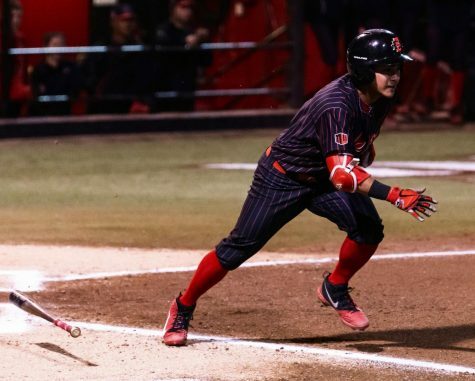 SDSU head coach Mike Friesen said that despite the loss, it benefits the team in the long run to play talented opponents like the Red Raiders. Texas Tech (3-0) scored its first goal just over one minute into the game, after junior forward Jade King sunk a shot from four yards out off an assist from freshman forward Charlotte Teeter. 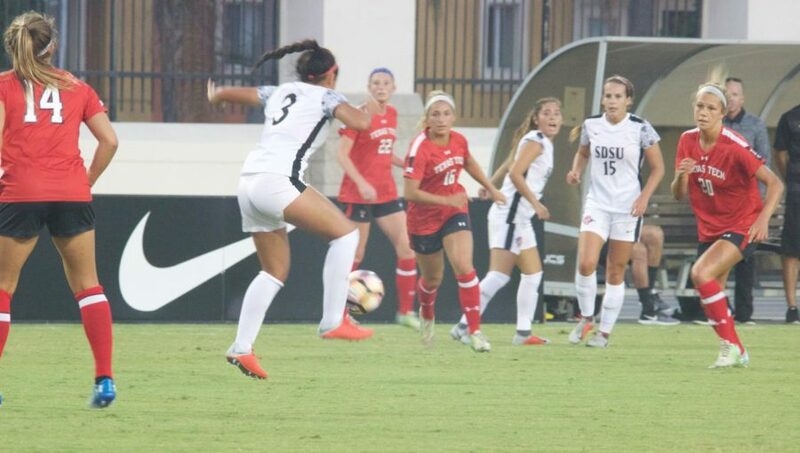 The Red Raiders’ lead then grew to 2-0 in the 34th minute after sophomore forward Kirsten Davis got behind the Aztec defense and buried an unassisted goal in the left of the net. The goals put SDSU (1-1) into a quick hole, which Friesen attributed to the team not coming out with the same aggressiveness as their opponent. “We did not do a good enough job of reciprocating on their energy and attacking right away,” Friesen said. 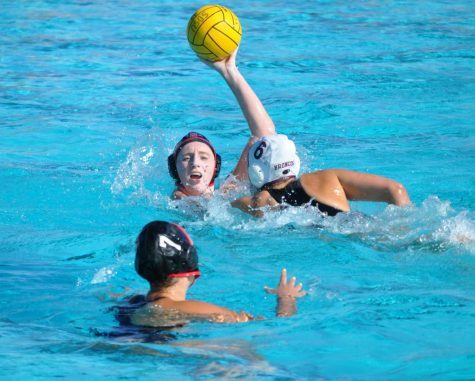 The Aztecs scored their lone goal in the 42nd minute, after freshman defender Lauren Dicus headed a corner kick sent in from senior midfielder Nikolina Musto into the upper left part of the net from 15 yards out. 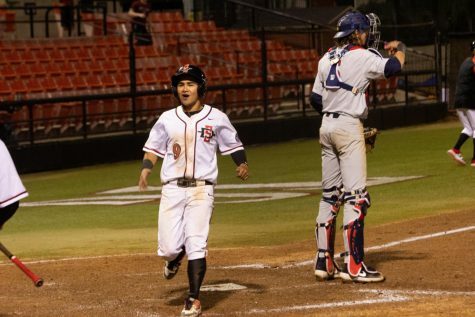 The goal was the first one of Dicus’ young career as an Aztec and the first goal scored against the Red Raiders this season. Dicus said scoring that goal gave the team the jumpstart it needed right before the second half. Texas Tech ended the game with a 16 shots to five advantage over the Aztecs, but were held to just four shots in the second half. 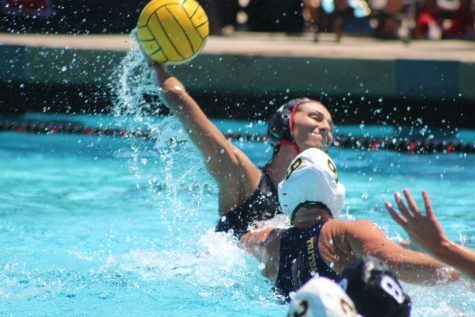 SDSU junior goalkeeper Gabby English ended the game with six saves. 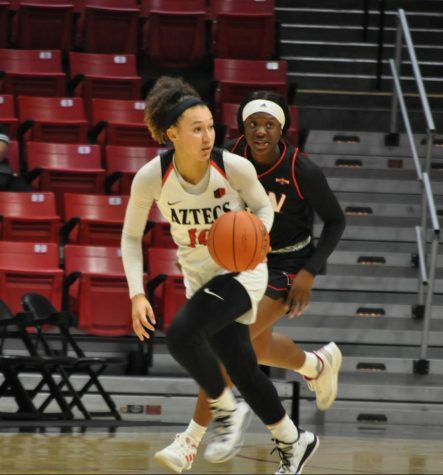 The Aztecs have a lot of freshmen stepping up into big roles on the team, and playing big minutes as the team is not 100 percent healthy. Friesen said this will benefit the Aztecs, as the young players will get meaningful game action early on. 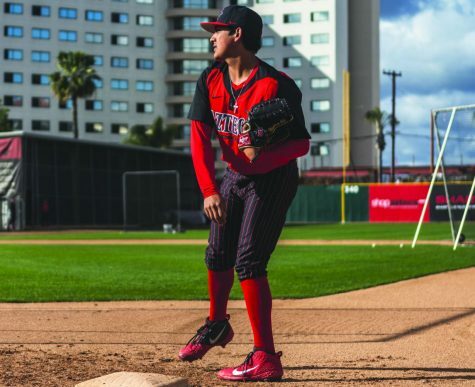 “There have been a lot of freshmen building up their confidence with each and every game, which is exactly what we need moving forward,” Friesen said. Friesen and the team also await the full return of last year’s leading scorer, Mia Root, who played a total of only 23 minutes against Texas Tech. Junior midfielder Rachel Speros said the team plans to keep what they learned in their back pocket as they move forward. 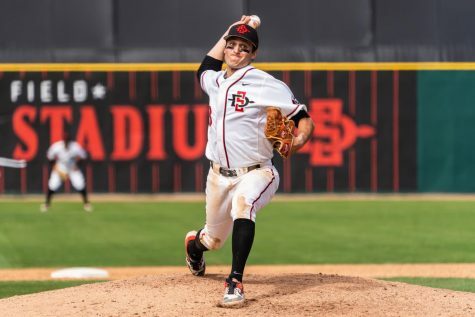 Up next for the Aztecs is their first road test of the season – a game againt Long Beach State at George Allen Field on Aug. 26.